Do you think that Legge was accidentally on purpose favoring his own wife over Callas? After all, he seemed to be pretty astute in showing off his own dear Elizabeth in recordings. The Karajan recording of Butterfly was shocking to me in that the orchestra almost completely drowns her out at times, especially in the beginning when she first appears. I'm wondering if such doings went unnoticed by Meneghini and HIS wife. To be honest, I don't. Both he and Schwarzkopf had tremendous admiration for her as an artist. It's just that Italian opera was not his milieu. His specialist area was German opera, and German vocal music. This was probably why there is some odd casting on many of the Callas sets. Why on earth we got the likes of Fernandi in Turandot and Ferraro in La Gioconda, is beyond me. Especially when you consider that Corelli was an EMI artist at that time. Sometimes some of these slightly odd decisions paid off, though others disagree. I actually think that Gedda makes a pretty plausible Pinkerton. He sounds like what his music is, a nice enough young man, who doesn't give enough thought to his situation. It makes his remorse in the last act all the more believable. On the subject of that Madama Butterfly, ZB, I can't say that I've noticed the orchestra drowning Callas out (I have the 1997 Callas Edition CDs). In fact the orchestra are nowhere near as prominent as they are in Karajan's later studio recordings, including the Butterflywith Freni and Pavarotti. Well, I have the LP so maybe there was some remastering for the CD. It's just that one can hardly hear Butterfly even after she arrives with her bridal entourage. Having her voice too much in the background is stretching realism too far. Now, I would like to call attention back to Mike's pictures of Callas where her eyes and hands are very prominent. Callas was very aware of her hands and liked them more than her voice or figure. She remained a fat girl in a slim woman's body. Serafin made her self conscious about the timbre of her voice, not the suave, rolling sound they were used to in Italy, calling it "vocaccia". And I agree that if she were around today, she would not be more than a blip on the radar. It was the whole congruence of events that made her and the time in which it happened. All I can say is to be grateful for what we have. Back to the expressive hands, this is really the kind of finish one would expect from a dancer. But Callas was a good pianist as well. There is a feedback from how one shapes one's hands. The feeling I believe goes both ways. Just doing that splayed back position in the first photo makes one FEEL tensed. Try it. She may have gotten some of this from Zeffirelli as well since Teresa Stratas spoke about how in rehearsal of Boheme, he impressed on her the importance of faint hands towards the end of the opera. ZB, admittedly Zeffirelli may have had some influence on Callas, but, from a dramatic, as opposed to musical perspective, Visconti was the greater influence. While it was the prospect of working with Callas, that lured Visconti into the opera house, it was also Visconti who directed most of her greatest successes at La Scala, (La Vestale, La Sonnambula, La Traviata, Anna Bolena, Ipghigenie en Tauride). He was also to have directed her return to La Scala in Poliuto, but he fell out with government authorities over the censorship of one of his films and withdrew. There are some interesting rehearsal photographs of Visconti and Callas, where she can be seen to be exactly copying certain gestures and poses that he suggests to her. There are also stories about how exasperated Di Stefano became, during rehearsals for La Traviata, when Callas, Visconti and Giulini would discuss in the minutest detail, how certain parts of the opera should go. They would work long into the night, determined to take a completely fresh look at the opera. Di Stefano was totally unused to this way of working. He was just used to turning up, learning his entrances and exits and giving his usual peformance. In fact he was so disgruntled, that on the opening night, when the accolades rained down on Callas and Visconti, he walked out of the production vowing never to work with them again. He never did work with Visconti again, though he was back in the recording studio with Callas later that year. Callas probably had as much influence on Zeffirelli as he on her. His one and only production at La Scala with her, was the 1955 Il Turco in Italia, her only really successful comic role. Thereafter he directed her in Dallas, in 1958 in La Traviata, and in 1959 in Lucia di Lammermoor, (this production was the Sutherland one borrowed from Covent Garden, in an exchange, which saw Callas take the Dallas Medea, directed by Alexis Minotis, to London). He later, in 1964, coaxed her out of retirement, and, most famously, directed her in her final Toscas in London and Paris, and the final Norma, also in Paris. This production, too, was to have come to London, but Callas's health failed her and she completely retired from the stage after one final Tosca at Covent Garden in July 1965. I've always wondered how someone who never heard Maria Callas live, but only from recordings, could possibly tell whether they like her or not. The sound quality of everything I've ever heard is just intolerable. The only recording I could find of Cherubini's Medée was the Italian version (Medea) with Callas in the lead rôle. I've never gotten this thing off the shelf again. I can't give a fair opinion of Callas because the recording's quality is abysmal. I've heard other stuff that was about as bad, or even worse sometimes. So what gives? I've never been able to figure this out. I'm not being facetious, since I'm glad if people do like her, and I don't think they're making it up... but how can you get a real idea of what she truly sounded like from that stuff? I would have thought that what you are hearing is what we are hearing and you simply respond differently. The studio recordings from the late 50s and early 60s seem, according to those who did hear her, let you know in good sound what she was about. Some live recordings are a trial I am sure, but there is plenty around that seems to represent her well. There is also the question of learning to listen through the sound to the voice itself. This is particularly difficult with singers from the period before LP. I find I can do it with electrical recordings, but, with one or two exceptions, find it almost impossible with transfers from acoustic 78s. I am pleased I have been able to penetrate them though, as I would otherwise have ignored the work of many great singers, who never made it to the LP era. Actually the same is true with old orchestral recordings. A friend of mine gave me a copy of Stokowski's 1936 recording of Rimsky-Korsakov's Scheherazade. You would think that with a piece of such orchestral splendour, there would be no point even trying to listen to it. However, though in sonic terms, it cannot hope to compete with more recent recordings, I have been able to discover some marvellous music making, by somehow listening through and beyond the reproduced sound. I admit it requires a bit of work, but the rewards are worth it. When it comes to the LP era, I confess that if the performance is great enough, I hardly notice the inferiority of the sound on some of these recordings, compared to their modern equivalents. Put another way, if I had to chose between the Callas/Da Sabata Tosca in old fashioned mono sound, and the Pappano/ Gheorghiu one in modern digital sound, the Callas set would still win hands down, as I find it a much more involving experience. Was she when young considered attractive? Depends on which comentators you read, though it has been said that even in her fat days, she had a certain statuesque beauty, which is born out in some photographs. 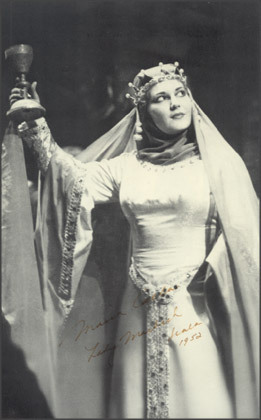 And here as Lady Macbeth in 1952. Her weight did tend to go up and down, though she was always plump, until she dramtically reduced her weight from 1953 to 1954, after which she remained slim and svelte until she died. "I was getting so heavy that even my vocalizing was getting heavy. I was tiring myself, I was perspiring too much, and I was really working too hard. And I wasn't really well, as in health; I couldn't move freely. And then I was tired of playing a game, for instance playing this beautiful young woman, and I was heavy and uncomfortable to move around. In any case, it was uncomfortable and I didn't like it. So I felt now if I'm going to do things right—I've studied all my life to put things right musically, so why don't I diet and put myself into a certain condition where I'm presentable." Here is an excellent article on her, it is not gush, it has a lot of technical discussion by musicians on what was individual about her and where her problems lay. According to the above mentioned article, "Why Callas lost her voice prematurely" is still an ardent topic of debate. I heard some amazing stories over the years even from voice teachers (one in particular) who said that it was because she lost weight. He also held to the tapeworm theory. Wow! Also there was a discussion of her allegedly shifting range. Maybe I can be of help, since I have a lyric soprano voice, worked with, taught, accompanied and screened singers for choirs over 30 years. Why lyric sopranos cannot sing the "Queen of the Night" is because of the high leger line F out of their range. However, during Mozart's time this was probably an E, and accessible to the likes of us in staccato. Callas did not hold the high E in the "Bell Song" that she sang in Italian as a "lyric-coloratura". OK, one CAN stretch the definition seeing there was plenty of the latter in that particular recording. The famous high Eb of Aida in Mexico City is the same optional flourish to the end of "Sempre Libera". And what a difference a half-tone makes!! As to the other end of the range, "the chest voice", Callas' teachers were very astute in the use of it, since developing the lower ones really facilitate the resonance of the higher ones. There's no mystery in being able to reach a low F# below middle C, although notes past an A (as in "Deh, Vieni Non Tardar") are not usually in active use by a soprano. In fact most women can reach a D below middle C.
Now you can take or leave my theory, seeing it does contradict one of my own teachers, and this has to do with the theory of the registers. The chest voice in men's and women's voices should not be brought up past the passagio into the head voice. I wrote recently about Caballe who neither belted out the high C in "O Patria Mia" or the high Bb in "Pace, Pace", but was STILL very effective. Personal experience has borne this out and I will NEVER do it again (I promise). So really weight has nothing to do with it, unless dieting brings on metabolic deficiencies. But keeping excess weight is not the solution either as Callas said it interfered with her breathing and movement. The chest voice in men's and women's voices should not be brought up past the passagio into the head voice. I was amazed to see the number of theories as I've always heard only 2, usually mentioned together: too many too heavy roles + overusing the chest voice (though most people agree she did that to great effect - it ruined her voice nonetheless; still - many say it was worth it). The overuse of chest voice is mentioned in the first paragraph of that "Vocal Decline" section in the wikipedia article but someone should definitely expand that one sentence into at least another paragraph. Another thing that surprised me in that wikipedia article is that they don't seem to mention a slight loss of color that many detect in her voice after the slimming down. The only thing that is mentioned on wikipedia is an opinion that her color actually improved, which is the opposite to what I've heard (I have no opinion of my own, as I don't know her recordings well enough ). Thanks for posting that link, Mike. What an interesting article it is. I suppose the reason for the multifarious theories as to why her voice declined so rapidly, is testament to the fact that nobody really knows and nobody ever will. Both Renee Fleming and Deborah Voight (sopranos themselves) touch on similar theories, which is interesting. Personally, I have always felt, that it was not the actual weight loss, but the diet that might have been the proble. Singers need an enormous amount of stamina to support their voices throughout an opera, and you only get stamina with proper nutrition, that is eating the right foods to give us energy, without piling on the pounds. In those days we knew less about nutrition and it is quite possible that Callas's diet deprived her of some of the necessary nutrients. That, and the punishing schedule she found herself following. A typical example is the summer of 1957. On July 4, she emabarked on two performances of La Sonnambula, in which she is in admirably secure voice, as can be heard on the recording preserved from the performances, and now available on EMI. 5 days late she is in Milan to record Turandot, a role that was no longer in her repertoire and which she really ought not to have been singing. That she acquits herself as well as she does, is cause for surprise, though she does show elements of strain. However 3 days after the Turandot sessions are over, she is back to record Manon Lescaut, and it is here that the effects of the previous days can be heard. She sounds utterly exhausted. Indeed some of the climactic high notes are as bad as they were to become in the mid 1960s, and this is probably why its release was delayed until 1959. With all due respect, "overuse" of the chest voice is not a cause of vocal decline, although "abuse" might be. Sopranos don't get to sing too many notes below a D, so where does the idea of "overuse" come from? On the contrary, it's very relaxing to settle into the chest tones (not to push the breath, of course). Singers who save their voices for performances, mark an octave lower. The high notes are much more perilous territory than the lower ones. Yes, indeed, heavy roles, those that require sustained force and height, are the troublemakers except for the Jessye Normans and Birgit Nilssons. Sorry, I should have made myself clearer: I meant using chest tones in very high areas usually reserved for head voice. Callas did that a lot. Or else I'm confusing terms - I'm not sure if I'm using correctly the English counterparts of the Polish terms... The general idea is that she extended registers beyond the standard. She should have, could have, been rightfully satisfied with her looks from childhood onwards but like many women were perversely persuaded by their environment that they are deficient and unworthy. (This aspect of popular culture bugs me to no end--maybe other women here can sympathize!!) Her slightly older sister Jackie was the star in the family. Both mother and older daughter conspired to make Maria into an ugly duckling. This manufactured rivalry and jealousy colored and spilled out into her other relations. Her mother, if she didn't say it in so many words (but probably did, anyway) you're fat and unattractive, so the only thing you have is your voice. This was a prime reason why most of her emotional life went into her art. Well, if you mean she extended the middle into the head voice, yes, she did and that was a possible cause of strain. But in the lower range, it simply is impossible to bring up the pure chest tones beyond a D (one note above middle C). There will always be a mix. She didn't do it, not even in Carmen. Very fascinating contributions all, and special thanks for the first hand insights into vocal production, ZB . On that subject Leopold simoneau wrote a fascinating book in which he treats most vocal theories with some amusement. Considering the extreme rarity of his nonpareil tenorizing, I think he must have been on to something! Re, Callas' appearance. I agree wholeheartedly with ZB considering the impact of mass culture on artists' perception of their bodies and the negative consequences it may have. Callas was not completely satisfied with her slimmed down looks. Her ankles (!!) remained fat (that portion of the skin does not shrink back) and she tried to hide them as much as she could. She was always extremely aware of perceived aesthetic shortcomings, an unending cause of stress and lack of self-assurance. Can I say I have never been so powerfully moved by any one voice? Honestly, this first listen is an experience like no other. Her voice has an intense power and fullness that I have never before heard. Equally stunning is her expression. And by this I mean that it is suprising that such a massive voice is also one that is so skillfully controlled unlike, for example, someone like Del Monaco. What I am also stunned and immensely pleased by is her lower register. As someone who often finds soprano's voices too ear pierching, I find this very satisfying. I makes her music-making sound sincere to me; she seemed to have a range that allowed her to do whatever she wanted, despite what conventional wisdom, previous performances and the roles dictated. Let me not take too much credit away from Serafin's brilliant orchestra or the other vocal standouts on the recording, such as Di Stefano. And of course the brilliant music in the first place courtesy of Mascagni. But this recording has immediately become one of my most treasured, and has led me to immediately order Lucia di Lammermoor with Karajan, Gobbi and Di Stefano (what a cast!) and Tosca, again with Gobbi and Di Sefano. Thanks also for the brilliant posts in this thread.